For the pork: Pre-heat the oven to 350°F. Rub the pork with salt and pepper, and then sear the meat in a covered skillet over high heat with the oil. Cook until the sides are golden-brown; this will help seal in the juices. Add the sliced garlic. When the garlic begins to turn golden, pour in the wine. Let the liquid reduce and then cook in the oven for 15 minutes. For the sauce: In a saucepan, melt the butter over medium heat. Add the diced onion and sauté for five minutes. Add the red pepper, cook for 2 more minutes and set aside. In a small pot, combine the lemon juice, water, sugar, chile, garlic and salt. Bring to a boil and stir continuously until the sugar dissolves. Add the mango along with the sautéed onions. Reduce the heat and continue cooking until the sauce thickens (about 25 minutes). To check if the pork loin is ready, use a meat thermometer. The pork is medium done when the temperature reads 140 to 150°F. If you prefer your meat well done, wait until the temperature reaches 160°F. Pork loin is a traditional Christmas dish in many Latin homes, including my own. In fact, my pork loin recipes are never missing from the dinner table at our holiday celebrations. And since I can't resist the blend of savory and sweet flavors, I thought I'd share my recipe for pork loin with mango sauce with you. 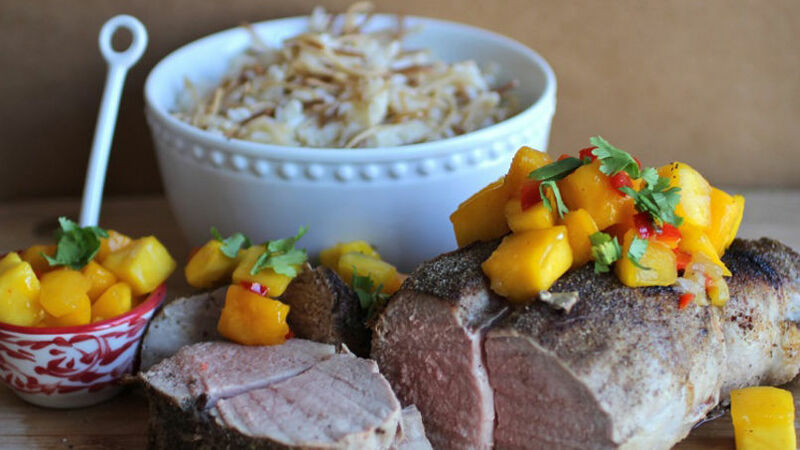 The mango sauce adds a delicious taste to the meat and makes this pork loin simply scrumptious. Best of all, this dish is easy to make at home and can be prepared quickly, just in time for the holidays.